Expressive crayons are specially designed for hands-on learning about self, family and community. Crayola Crayons are specially designed to provide truer colors, smooth laydown, durability, and easy blending. 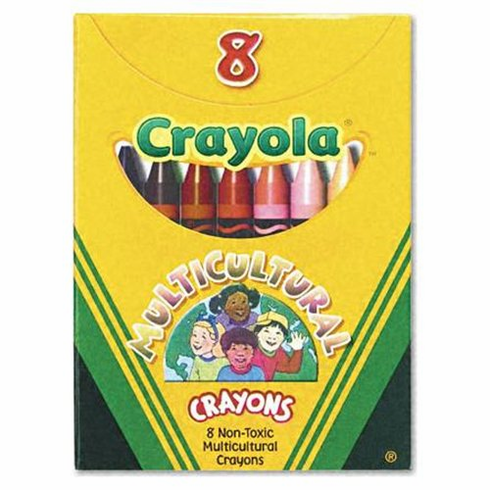 Multicultural crayons come in an assortment of realistic skin tones: mahogany, apricot, burnt sienna, tan, peach, sepia, plus black and white for blending. Meets the artistic needs of today's culturally diverse classrooms. Convenient, reusable tuck box. 8 Regular size crayons - 3 5/8" x 5/16". AP Certified non-toxic.